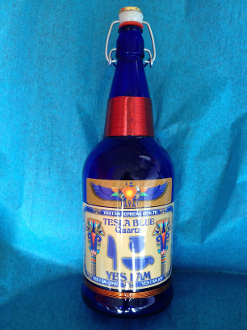 Premium Hand Crafted Tesla Blue Quartz Bottle. Hand wrapped coils intricately designed with alternate layers of pure copper windings, promoting ion saturation into the water, increasing microcirculation allowing better taste and higher energy to your drinking experience. Each bottle is QUART ACTIVATED GLASS through TESLA TECHNOLOGY. This activation of the quartz crystals within the bottle streams ions into the liquid within the bottle, creating better taste with ion rich saturation. Each Tesla Premium Bottle has a high powered rare earth magnet under and on top of bottle. The cap has a 24 karat gold covered high powered magnet.